This is the main objective of the seminar, organized by the BBVA Foundation and Ivie, as part of their joint-work program in this area. 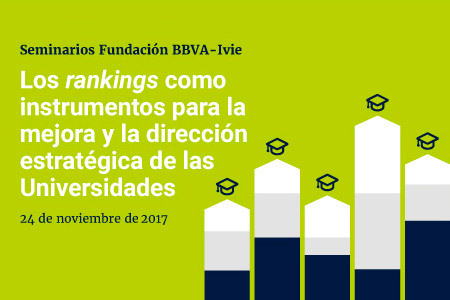 The most visible result of their research activity is the U-Ranking project, which has been carried out for five consecutive years, resulting in several reports on the functioning and trajectory of the Spanish University System. What is the current scenario of university rankings in Spain? What are their achievements and limitations and what are the most important differences among the various tools available? What assessment can be made of U-Ranking in the current scenario and what are some desirable and feasible improvements? From a university strategic management perspective, how useful are general rankings, specialized rankings and rankings that compare universities within homogeneous groups? Should employability be a relevant factor in university rankings? Should it be included in the construction of university rankings? Is it possible to currently assess the differences in the employability of graduates from different universities? What causes of these differences can be controlled by the universities? What are the reasons behind the different practices in this area? Which improvements should be made in the information on graduate employability and how can universities use those results? The Seminar aims to enhance the reflection of the results of university activities in Spain, in several ways: providing information and analysis to measure their performance; examining the lessons learned from different experiences of best practices; and considering the importance of rankings as tools to improve the capacity of the university system in responding to the demands of the knowledge society and the productive model by making a more effective use of human capital. The Seminar is directed towards university and higher education agents responsible for strategy, programming and well-functioning of public and private universities, and social council members, as well as those interested in university activities and job-market integration, education policy-making analysts, academics and the media. “Rankings en sistemas universitarios heterogéneos. El caso español y U-Ranking.